The namesake of the castle was Götz von Berlichingen, who was born here in 1480. A famous knight in German history, Götz was romanticized as a kind of Robin Hood, who stole from the rich to give to the poor when he wasn’t busy fighting in military campaigns against the Turks and French. He was also known as Götz of the Iron Hand, a nickname which comes from the prosthetic that replaced the real one he lost at the siege of Landshut. Banished from the empire on a couple of occasions, he returned to lead a faction in the Peasants’ War. 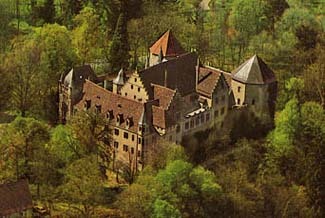 Götz died at age 82 at nearby Hornberg Castle (also a castle hotel). Goethe immortalized him in one of his dramas. Götzenburg castle has a very down-to-earth, rustic feel. Several of the rooms are located in an outer bailey and several in the main castle. If you want authenticity, opt for a room in the castle. Along the Romantic Road, the Hohenlohe Plain is an area of sleepy postcard villages and German Renaissance castles such as Burg Götzenburg. There are lots of medieval touches around the castle such as weaponry on the wall, suits of armor, and a massive piece of antique furniture here and there. Each spacious guest room is unique. With rooms in the main castle, you might find a four-poster canopy bed or a beamed ceiling. Guest rooms located in the outer bailey are bright, cozy, and furnished in a more traditional German country style. All have ensuite baths. Dinner is heavy on the meat, which comes in generous portions.